Reliable estimates of the magnitude and frequency of floods are essential for the design of transportation and water-conveyance structures, flood insurance studies, and flood-plain management. Flood-frequency estimates are particularly important in densely populated urban areas. The U.S. Geological Survey (USGS) used a multistate approach to update methods for determining the magnitude and frequency of floods in urban and small, rural streams that are not substantially affected by regulation or tidal fluctuations in Georgia, South Carolina, and North Carolina (Feaster and others, 2014). The multistate approach has the advantage over a single state approach of increasing the number of streamflow-gaging station (streamgages) available for analysis, expanding the geographical coverage that would allow for application of regional regression equations across state boundaries, and building on a previous flood-frequency investigation of rural streamgages in the Southeastern United States. This investigation was funded as part of a cooperative program of water-resources investigations between the USGS, the South Carolina Department of Transportation, and the North Carolina Department of Transportation. In addition, much of the data and information for the Georgia streamgages was funded through a similar cooperative program with the Georgia Department of Transportation. 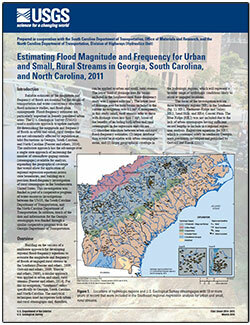 Methods for Estimating the Magnitude and Frequency of Floods for Urban and Small, Rural Streams in Georgia, South Carolina, and North Carolina, 2011. Feaster, T.D., Gotvald, A.J., and Weaver, J.C., 2014, Estimating flood magnitude and frequency for urban and small, rural streams in Georgia, South Carolina, and North Carolina, 2011: U.S. Geological Survey Fact Sheet 2014–3015, 2 p., https://dx.doi.org/10.3133/fs20143015.